Mahendra Singh (MS) Dhoni (born July 7, 1981 in Ranchi, Jharkhand) is an Indian cricketer. He is an aggressive right-handed batsman and wicketkeeper. He is currently ranked number four in the official ICC cricket rankings for batsmen in Limited over internationals. He was picked to play for the Indian cricket team in December 2004 and has been a regular member of the Indian one-day international team since then. His success in the limited overs format has also secured him a Test spot, and he is rapidly becoming one of the most famous & marketable icons in India, noted for his shoulder length hair. Dhoni (affectionately known as Mahi), made his debut for Jharkhand in the 1999-2000 season as an eighteen year old. He started off his career with modest performances at the local level. He was noticed by the national team selectors in 2004 after his performances in first class tournaments such as the Deodhar Trophy and the Duleep Trophy. Dhoni was selected to represent India ‘A’ on a tour of Kenya and his performances were good enough to win him selection in the Indian national team, making his one-day international debut against Bangladesh in Chittagong in December of that year. Dhoni’s best performance for India thus far was an unbeaten score of 183 off 145 balls against Sri Lanka at Jaipur on 31 October 2005, equalling the second best score by an Indian in ODIs. It was also the highest innings recorded by a wicket-keeper, and the highest number of sixes in an innings for a wicketkeeper with ten (all-rounders Sanath Jayasuriya and Shahid Afridi have hit 11). He also broke Saeed Anwar’s record of most runs scored off boundaries by scoring a total of 120 runs off 4s and 6s eclipsing the previous record of 118. This has broken the record for the highest individual score for a team batting second. This has also established the new Indian record of number of sixes in a match, overtaking previous record holders, Sachin Tendulkar and Sourav Ganguly (both hit seven 6′s in a match). Earlier, in 2005 he scored 148 against Pakistan in Vishakapatnam, in his fifth one-day international; the score came off only 123 deliveries. At the end of the year Dhoni was rewarded a BCCI contract, starting with a B-grade contract. Dhoni’s current batting average in ODIs is just over 50 (as of April 2006), the highest by any Indian player with more than 20 innings. With a career ODI batting strike rate of more than 100 he remains the only batsman with the unique double of a 50+ average scored at more than a run a ball. Currently, Dhoni has one of the highest strike rates in the world (103.00 runs per hundred balls). With 44 sixes in 38 ODI innings, Dhoni has hit more sixes than he’s played international matches. Following his good one-day form against Sri Lanka, he ousted Dinesh Karthik in December 2005 as the Indian Test wicketkeeper. He made his maiden Test century against Pakistan in the 2nd Test at Faisalabad in January 2006, reaching the landmark in just 93 balls. Dhoni’s career batting average at the end of the ODI series against Pakistan in Abu Dhabi stands at 52.76, which is the fourth highest for any batsman having scored at least 1,000 runs in one-day internationals, behind Australians, Mike Hussey Michael Bevan, and Englishman Kevin Pietersen. On 31st October 2005 Mahendra Dhoni scored 183* runs of just 145 balls, accompanying that there are a list of records which he broke. He broke Adam Gilchrist’s record of 172 for the highest score made by a wicket keeper. Dhoni married Sakshi Singh Rawat on July 04, 2010. Sakshi, a Kolkata girl, is studying hotel management and was working as a trainee at the Taj Bengal when the two of them met two years ago. The wedding stumped the media and the fans as it took place only a day after the couple got engaged. Bollywood actress Bipasha Basu, a close friend of Dhoni, was quick to inform the media that the wedding was planned for months and was not a spur of the moment decision. 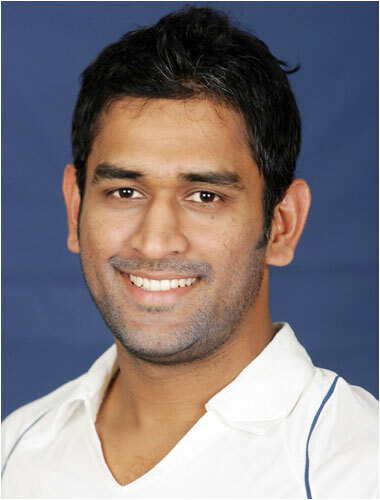 MS Dhoni signed with Kolkata-based celebrity management company Gameplan Sports in April 2005. Currently Dhoni has 20 endorsements, only Shahrukh Khan has more (21). In 2007 Dhoni had 17 endorsements. The following is the list of endorsements signed by Dhoni. Checkout the ASCII Art, Wallpapers and Pictures of Mahendra Singh Dhoni in the below link. Extract the Files from WinRAR Archive. Please use Lucida Console font to view the ascii art in Notepad. Before that in Notepad go to Format and Uncheck the Word Warp and then Go to Font and Reduce the Font Size to 3 to 4 pt. Use only Lucida Console Font. The Chinese teacher and philosopher Confucius was the founder of the school of philosophy known as the Ju or Confucianism, which is still very influential in China. He was born on 551 B.C.E in Tuo, China. Confucius is the Latinized name of K’ung Fu-tzu (Great Master K’ung). His original name was K’ung Ch’iu; he is also known as K’ung Chung-ni. The most detailed traditional account of Confucius’s life is contained in the Records of the Historian (Shih chi) by Ssu-ma Ch’ien, who lived from 145 B.C.E. to 86 B.C.E. Many modern scholars have dismissed this biography as only legend. Nevertheless, from this manuscript one can reconstruct a satisfactory outline of the philosopher’s life and influence. According to the Records of the Historian, Confucius was a descendant of a branch of the royal house of Shang, the dynasty (a family of rulers) that ruled China prior to the Chou, and a dynasty which ruled China from around 1122 B.C.E. to 221 B.C.E. His family, the K’ung, moved to the small state of Lu, located in the modern province of Shantung in northeastern China. It was believed that Confucius’s father divorced his first wife at an advanced age, because she had borne him only daughters and one disfigured son. He then married a fifteen-year-old girl from the Yen clan, who gave birth to Confucius. Ssu-ma Ch’ien refers to the relationship as a “wild union,” which very possibly indicates that Confucius was an illegitimate child, or a child born out of wedlock. In the Analects, Confucius’s book of teachings, he writes that during his youth he was poor and was forced to acquire many different skills. It is clear that even though the fortunes of his family had declined, he was no commoner. Confucius unquestionably belonged to the aristocratic (ruling) class known as the shih. In the time of Confucius most shih served as court officials, scholars, and teachers. Confucius’s first occupation appears to have been as keeper of the Lu granary. Later he worked as supervisor of the fields. Both were low positions but consistent with his shih status. It is not known exactly when Confucius began his teaching career, but it does not appear to have been much before the age of thirty. In 518 B.C.E. he is said to have met the famous teacher Lao Tzu (sixth century B.C.E. ), who reportedly bluntly criticized Confucius for his stuffiness and arrogance. Confucius eventually returned to Lu around 515 B.C.E. For several years after his return he does not appear to have accepted a governmental position. Instead it appears he spent most of his time studying and teaching, gathering a large number of students around him. Although one can only guess about the school’s exact course work, it undoubtedly included instruction in ritual, music, history, and poetry. Around 498 B.C.E. , Confucius decided to leave his home in Lu and embark on a long journey throughout eastern China. He was accompanied by several of his disciples (followers). They wandered throughout the eastern states of Wei, Sung, and Ch’en and at various times had their lives threatened. Confucius was almost assassinated (killed) in Sung. On another occasion he was mistaken for the adventurer Yang Hu and was arrested and held until his true identity became known. Confucius was received with great respect by the rulers of the states he visited, and he even seems to have received occasional payments. He spent much of his time developing his ideas on the art of government, as well as continuing his teaching. He acquired a large following, and the solidification of the Confucian school probably occurred during these years. Not all of his disciples followed him on his travels. Several of them actually returned to Lu and assumed positions with the Chi clan. It may have been through their influence that in 484 B.C.E. Confucius was invited back to Lu. Confucius was warmly received in Lu, but there is no indication that he was given a responsible position. Little is known about his last years, although this would have been a logical time for him to work on the many texts and documents he supposedly gathered on his journey. 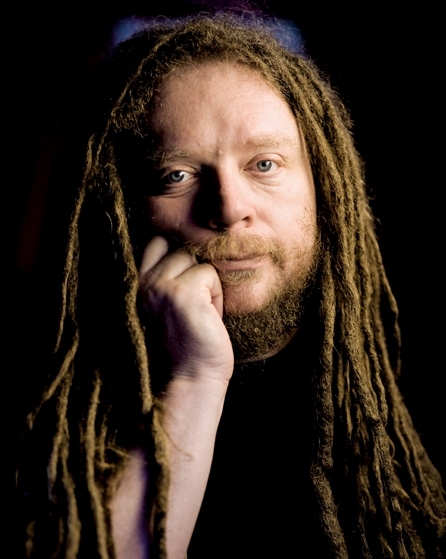 Much of his time was devoted to teaching, and he seems to have remained more or less distant from political affairs. This was an unhappy period for Confucius. His only son died about this time; his favorite disciple, Yen Hui, died the very year of his return to Lu; and in 480 B.C.E. another disciple, Tzu-lu, was killed in battle. Confucius felt all of these losses deeply, and his sadness and frustration must have been intensified by the realization that his political ideas had found no support among the rulers of his own state. Confucius died in 479 B.C.E in Qufu, China. His disciples conducted his funeral and observed a mourning period for him. Although we cannot be certain that Confucius wrote any of the works he is credited with, it is still possible to know something about the general nature of his philosophy. Shortly after his death his disciples compiled a work known as the Lun yü, commonly translated as the Analects but more accurately rendered as the Edited Conversations. This work consists of conversations between Confucius, his students, and an occasional ruler. The primary emphasis of the Lun yü is on political philosophy. Confucius taught that the primary task of the ruler was to achieve the welfare (well-being) and happiness of the people of his state. To accomplish this aim, the ruler first had to set a moral (good character) example by his own conduct. This example would in turn influence the people’s behavior. 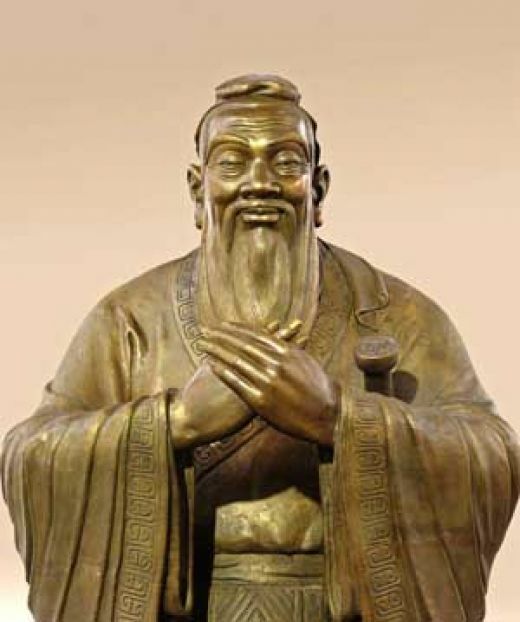 Confucius is the first Chinese thinker to introduce concepts that became fundamental not only to Confucian philosophy but to Chinese philosophy in general. The most important of these are jen (benevolence), yi (propriety, or being proper), and li (ritual, or ceremony). Confucius believed that the chün-tzu, or “gentleman,” must set the moral example for others in society to follow. In the Lun yü jen, what has been translated as humaneness or benevolence (being kind) is a quality a chün-tzu should develop and attempt to encourage in others. Li is considered the rules and ritual that are observed in religious and nonreligious ceremonies and, as applied to the chün-tzu, composed rules of behavior. Yi represents what is right and proper in a given situation. The chün-tzu, by observing the ritual and because of his good nature, always knows what is right. Confucius was basically a humanist and one of the greatest teachers in Chinese history. His influence on his immediate disciples was deep. His students continued to explain his theories until, in the first Han dynasty (206 B.C.E. –8 C. E.), the theories became the basis of the state ideology, the body of ideas reflecting the social needs of a culture.